We are the market leading provider Site Insurance, Structural Warranties and Legal Contract packs for Self-Builders, Community Groups, Renovators and Enabling Developers. Your builders Public Liability cover will not adequately cover the whole project and home insurance excludes renovation and alteration works, so to find out how to correctly insure your project, have a chat with one of the team. Self-Build Zone is the sole provider for Site Insurance and Structural Warranty products for the NHBC for self builders. Building or creating a home, either from scratch or as a conversion or renovation project can be one of the most rewarding challenges of your life. The type of project you are embarking on will invariably involve a significant amount of investment, so ensuring you have the correct level of cover in place is essential. 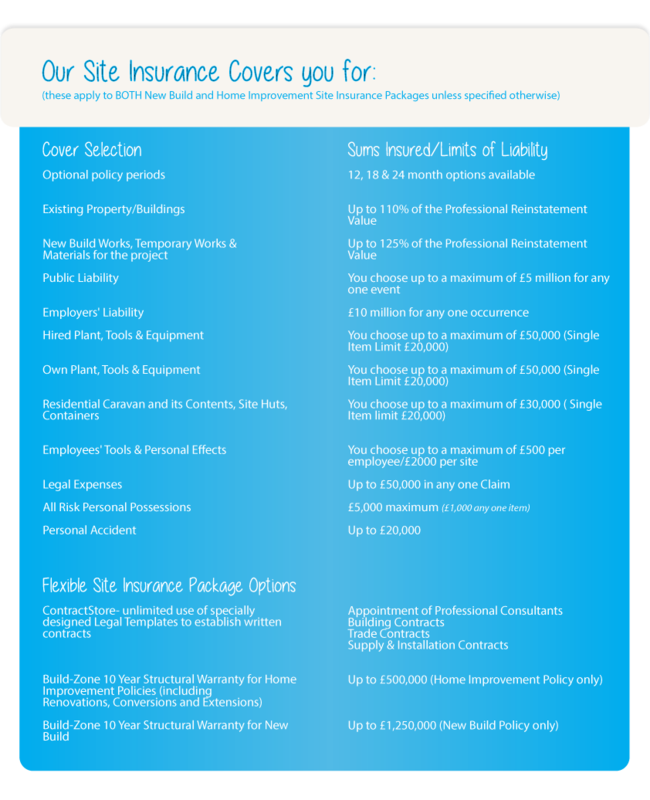 Site Insurance is of fundamental importance when investing your money into property development. Whether your project is a Conversion, Renovation, Extension or a New Build you will invariably need comprehensive protection for the new works, existing structure (if there is one) and the rest of the site. You must protect the existing structure and all the new work against such losses as fire, theft, flood, storm damage, vandalism and accidental damage. Do not just rely on your standard building insurance to cover the cost of any loss as, more often than not, they will not pay out on a loss involving a property under development. It’s always best to protect your building project from the moment you purchase the plot, our cover is available at competitive price and can be offered as a flexible range of time periods. The Build-Zone 10-Year Structural Warranty is a re-branded version of the Self-Build Zone Warranty and provides a much better alternative to Architect’s Certification and is similar to NHBC and other Structural Warranty products. It is specifically designed for New Build, Conversions, Extensions and Completed Properties and is backed by Lloyd’s of London. Build-Zone is constantly going through the process of Lender approval. Why do I need a Structural Warranty? Apart from the peace of mind you gain by having the Build-Zone Structural Warranty, most Lenders will probably require a warranty as part of the lending criteria. Useful also if your circumstances change and you need to sell the property in the next 10 years you will find it likely that your prospective purchaser’s Lender will require a structural warranty on the property before releasing any money. Do not rely on an Architect’s Certificate as this will only provide cover in the event of you are able to establish negligence by the architect, which will be covered under their Professional Indemnity Insurance but only for a period of 6 years and it will not cover workmanship or defective materials. The Build-Zone Warranty applies for a period of 10 years and will respond straight away as a ‘prime’ policy and the insurers will then take on recovery action against those responsible. For a typical project there are two options available:- 1. ‘With Building Control’ or 2. ‘Without Building Control’. From Initial Notification, we can normally have a surveyor to site within 5 working days. After Initial Notification, your nominated surveyor can be on site within 2 working days. You will have a nominated surveyor looking after your project from start to finish and will enable open communication. A formal Plan Check is carried out along with checking calculations. Should any problems arise, they will be highlighted in a report. 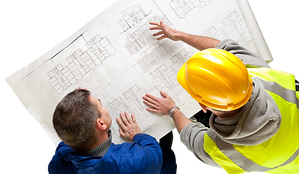 The surveyors are highly qualified and experienced individuals used to working with Self Build projects. By combining Building Control with our Technical Audit inspections, you will save money. If you have already made your building regulation application to the Local Authority, then you will need to request a Warranty ‘without Building Control’. We then arrange for a suitable schedule of Technical Audits to be carried out during the project’s duration alongside the Local Authority Building Control inspector. Please note, you will still need to allow us a minimum 5 days notice from initial notification. ContractStore is a leading supplier of online legal documents. Founded in 2002 by Giles Dixon, a solicitor specialising in construction law, ContractStore has over 300 contract templates that can be downloaded from its website. These cover a wide range of domestic and international business transactions, and the company has thousands of satisfied customers in England and around the World. All ContractStore’s documents are written in plain English and come with detailed explanatory notes. Published in MS Word, the documents are easy to download and complete. In recent years Giles Dixon and ContractStore have worked with Selfbuild Zone to develop a collection of contracts suitable for home owners and self-builders. These include forms for the appointment of professional consultants as well as builders, trade contractors and suppliers – in other words, the key relationships that need proper contract documentation on any building project. These templates can now be bought and downloaded directly from the Selfbuildzone website.